The NSC was funneling arms to the Nicaraguan contras before Oliver North’s resupply network was operational. US aid to Saudi Arabia was being forwarded to the contras via the Karachi, Pakistan-based Bank of Credit & Commerce International (BCCI). While House of Saud-bound money was being diverted towards thecontras, one of BCCI’s biggest initial depositors was the Shah of Iran, whose Swiss BCCI accounts were bulging. With the ruling families of the Nixon’s “Twin Pillars” on board, BCCI would become the mixing bowl into which Persian Gulf petrodollars were stirred with generous helpings of drug money to finance worldwide covert operations for the CIA and its Israeli Mossad and British MI6 partners. BCCI was the bank of choice for the world’s most notorious dictators, including the Somoza family, Saddam Hussein, Philippine strongman Ferdinand Marcos and Haiti’s Jean-Claude “Papa Doc” Duvalier. The South African apartheid regime used BCCI, as did Manuel Noriega, who strode into BCCI’s Panama branch regularly to collect his $200,000/year CIA paycheck. Frequenting the Karachi headquarters of BCCI was valued account-holder Osama bin Laden. With branches in 76 countries, BCCI dealt in conventional and nuclear weapons, gold, drugs, mercenary armies, intelligence and counter-intelligence. These interests were often shielded behind more legitimate fronts such as the shipping of Honduran coffee or Vietnamese beans. 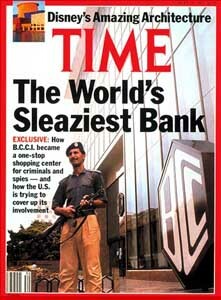 The bank had close relations with the CIA, Pakistan’s ISI, the Israeli Mossad and Saudi intelligence agencies. It was the financial glue that bonded numerous seemingly disparate public scandals together. BCCI’s main stockholders were monarchs and wealthy oil sheiks from the Reagan-manufactured Gulf Cooperation Council (GCC) nations. It was founded in 1972 in Pakistan by Agha Hasan Abedi, a close friend of Pakistani military dictator Zia ul-Huq. Abedi initially solicited deposits for the bank from expatriate Pakistanis working in the UAE. The “N” stands for Nathan, who once loaned French tyrant Napoleon five million pounds at the same time he was loaning his British Waterloo adversary the Duke of Wellington money to equip his army. Nathan Rothschild later commented of the incident, “It was the best business I have ever done.” The “M” stands for Mayer, a student of the esoteric Jewish Cabala who launched the Rothschild banking dynasty with embezzled money and acquired nobility titles for the family by the early 19th Century. Bank of America executive Roy P. M. Carlson orchestrated the BCCI deal. Carlson later joined Safeer, the Tehran consulting firm founded by former CIA Director and Ambassador to Iran Richard Helms. Carlson became chairman of Bert Lance’s troubled National Bank of Georgia (NBG), which had already been secretly taken over by BCCI with the help of Saudi billionaire Ghaith Pharaon. NBG was a client of Kissinger Associates, which also “advised” the Saddam-arming Banca Nacionale de Lavoro(BNL). Helm’s partner at Safeer – Iranian business tycoon Rahim Irvani – controlled the Melli Group where Carlson served as president. Irvani founded an off-shore company to hide BCCI’s purchase of former US Defense Secretary Clark Clifford’s First American Bank. Helms engineered the takeover. The late Sheik Khalid bin Mahfouz, the Saudi Arabian billionaire who controlled National Commercial Bank – the biggest bank in the Arab world – owned 20%. The al-Khalifa monarchs of Bahrain and the al-Qaboo monarchs of Oman also owned large shares in BCCI. And BCCI owned the National Bank of Oman. In 1976 BCCI set up a subsidiary in the Cayman Islands known as International Credit & Investment Company (ICIC). It was through this branch of BCCI, as well as Karachi branch – run by President Zia ul-Huq’s son – that the most circumspect financial transactions took place. A chart found in a White House safe concerning Oliver North’s Nicaraguan contra resupply efforts listed an “I.C.” in the Cayman Islands at the epicenter of North’s Enterprise network. Private donations were funneled through ICIC and ended up in Lake Resources’ accounts at Credit Suisse in Geneva controlled by Richard Secord. Secord was then a key “advisor” to the House of Saud. BAC become the biggest drug money laundry facility for Medellin Cartel cocaine dinero bound for the Honduran arms supermarket supplying the Nicaraguan contras with Enterprise weaponry. Whenever Aga Hasan Abedi ran low on money he would issue more BCCI stock and sell it to Sheik Kamal Adham, head of Saudi Arabia’s General Intelligence Directorate; or to A. R. Khalil, another top-ranking Saudi intelligence official and CIA liaison. Adham and Khalil got the money to buy the stock by procuring “loans” from ICIC in the Cayman Islands which were never repaid. With Secord now running the Enterprise from Riyadh, where he was serving as Reagan’s Chief Liaison to Saudi Arabia, Saudi intelligence was busy laundering drug money through ICIC. Similar loans were issued by ICIC to Sheik Mohammed bin Rashid al-Maktoum, scion of the UAE ruling family, and to Faisal Saud al-Fulaij, who as chairman of Kuwait Airways in the early 1970’s received over $300,000 in bribes from Boeing. Al-Fulaij was also tied to Kuwait International Finance Company. These ICIC loans were routed through either Banque de Commerce et de Placements – BCCI’s Swiss branch run by Rothschild lieutenant Alfred Hartman – or the National Bank of Oman, which BCCI owned. The reason Abedi kept running out of money was that BCCI’s Karachi branch, run by Zia ul-Huq’s son, was financing CIA mujahadeen armies in Afghanistan. In 1978 one of BCCI’s largest depositors, Pakistani Lieutenant General Fazle Haq, was appointed governor of Pakistan’s Northwest Province. Haq was President Zia’s right-hand man. In his new position he took control of BCCI funding of the mujahadeen. He also took charge of the Pakistani heroin trade. BCCI funneled millions to Pakistani military and ISI officials from CIA accounts at its Karachi branch. BCCI was so involved in the CIA effort that its own personnel would often ferry weapons to mujahadeen bases near Peshawar in Haq’s Northwest Province, just inside Pakistan’s border with Afghanistan. These same BCCI employees would then serve as heroin couriers for the trip back to Karachi. The bank became so enmeshed in Pakistani affairs that you could scarcely tell the difference between the two. In addition to the ICCI loans, BCCI was kept afloat by Bank of America, which transferred it a cool $1 billion a day until 1991. Bank of America acted like a global vacuum cleaner, sucking up deposits for the bank from around the world. Most of these deposits were diverted to the Karachi branch. Bank of America also had its own large Karachi branch. There were at least 10 telex lines between Bank of America-Karachi and ICIC in the Cayman Islands.